Vizio’s SB4031-D5 is part of their latest 2016 lineup of sound bar audio systems. This particular model contains an overall sleeker design than last year’s models, making it even more room decor friendly for a less intrusive presence within your living space. The “3” in the 3.1 designation means the sound bar contains a Left/Right plus Center speaker configuration for a total of three 4″ drivers. The “.1″ is for the subwoofer which houses two 6.5″ drivers. 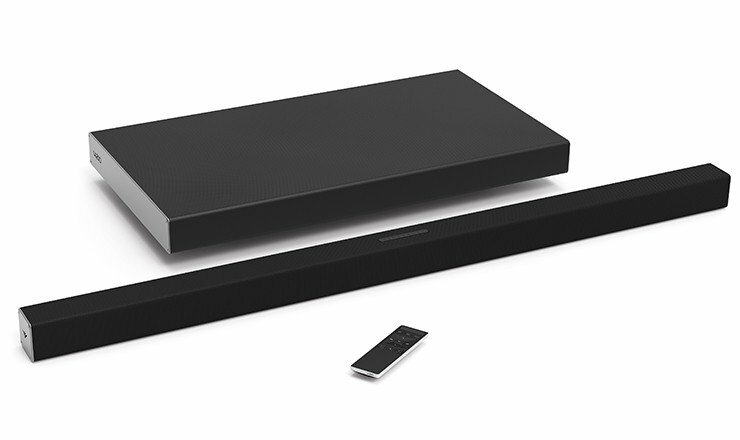 The 40″ long sound bar has a very slender height and depth of only 2.05″ X 2.0” respectively. This size should allow it to be table top mounted in front of most if not all flat panel displays without blocking the lower portion of the screen. The sound bar can also be mounted to a wall and is supplied with the mounting hardware. The top of the sound bar contains buttons for power, input source, Bluetooth input for pairing and volume control. The most notable eye-catching change to this current model when compared to last year’s is the subwoofer; this latest design contains a slim profile that I found to be very attractive. You also have a choice in setup options that allows the subwoofer to be either vertically (with the supplied feet) or horizontally mounted. The horizontal configuration will allow you to place the sub into tight spaces such as under your sofa. Even though the subwoofer has a slim profile design, its physical foot print is somewhat large measuring 24.2”W x 13.1”H x 3.06”D. However, this is a necessary trade-off that enables the sub to product decent bass output. Although I do like the design of this sub, I couldn’t help but wonder if its performance has been affected by its slender form factor. I’ll talk more on this later. The SmartCast feature uses your homes Wi-Fi to stream content that is controlled by the Vizio SmartCast app that you download to your smartphone or tablet, which is then used as a remote. This will allow you to connect multiple Vizio SmartCast speakers together to cast music to any or every room in your home simultaneously. The app also has Google Cast built-in and allows you to cast music from any Google Cast enabled audio app. In my opinion the SmartCast is a very useful feature that enhances and simplifies the task of enjoying your favorite music throughout your home. The supplied remote is compact in size with all the necessary buttons to operate the system from your seating position. The remote also as an LCD display which displays the sound bar settings. The SB4031-D5 isn’t the first Vizio sound bar system I’ve reviewed. The previous Vizio system I evaluated was the S3821W-CO which yielded very good performance for such an inexpensive sound bar rig. But after listening to the SB4031-D5, I believe the sound quality is even better than the S3821W-CO, yet I can’t be certain of this since I wasn’t able to do a direct comparison, but going off of memory alone, the SB4031-D5 seems to be the winner. I was impressed with the very open, full-bodied and spacious audio the sound bar delivered, enabling the sound to spread well beyond the boundaries of the speaker. The sound was also very detailed and refined which allowed me to hear the distinct characteristics of the music and TV content I listened to. Furthermore, the treble and midrange frequencies were delivered admirably and well defined within the sound field, and without sounding harsh or edgy when played at moderate and fairly loud volume levels. However, pushing the speaker to extreme volume levels will exhibit the sound characteristics mentioned above. I was also impressed with the vocal reproduction on this system; vocals were very clear and distinct with a nice tonal balance for a natural and realistic sound presence. What about the bass! Well, I must say I was pleasantly surprised with the depth and punch of the bass output from such a slender speaker box design. The bass was quite deep in the midbass frequencies and could play fairly loud before the output would start to compress. Even though this subwoofer delivers deep and respectable bass, it cannot, however, reproduce the deep sub bass that is present in many movie soundtracks. But this comes as no surprise since the compact size of the subwoofer enclosure and relatively small 6.5″ drivers aren’t capable of producing this type of low level bass. Overall, I was delighted with the audio quality of the SB4031-D5, and in my opinion is at its best with movie soundtracks which simply explode with dynamic sound reproduction. Music reproduction is also very good on this sound system, especially for a compact sound bar and subwoofer configuration, and is capable of producing room-filling sound that will bring more life to your favorite tunes. Vizio continues its tradition in delivering sound bars with very good sound quality at an affordable price. 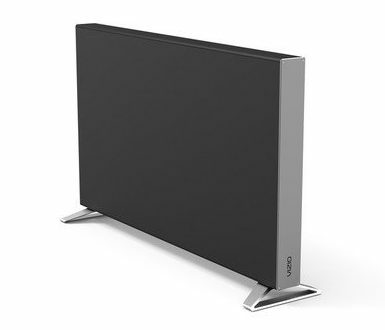 Although, the SB4031-D5 is more expensive than similar Vizio models in recent past; it does, however, offer an increase in sound quality, SmartCast capability, as well better aesthetics for this modest price increase, which makes it one of the better buys in the highly competitive sound bar market. •	Sound bar with feet: 3.42 lbs. Warranty: One year parts and labor. Free lifetime technical support. There really isn’t a perfect equation for this setup. For the Bass, Treble and Center, I just set them to my liking since they are tone controls and not level controls. For the sub level, I set it to where it blended well with the soundbar and to when it sounded best to my ears.